This blog entry about the events of Tuesday, June 21, 2011 was originally posted on June 22, 2011. PART 3 (DAY 5): “It’s so hot,” Cheryl said. “And I thought the northern route would have been cooler.” It was only about 10 a.m. in the morning, and the sun was beating down on us hard already. Coincidentally enough, during our quick morning tour of downtown Chicago, the classic rock tune “Summer In The City” came on — and on the day of the summer solstice too. Perhaps it was fitting that we went around the city of Chicago that Tuesday morning, before heading out west into the American countryside. Chicago was once one of the gateway cities to the west (only rivaled by St. Louis), a grand city formidable to host the 1933 World’s Fair, as well as every John Hughes movie in the 80s. Some consider to be the Great American City. Sure New York is great, but it’s more of a city that belongs to the sisterhood of world cities that just so happens to be on American soil. In terms of the great American classic metropolis, few rival The Windy City with its blend of diversity, character, attitude, food, and arts. After a quick photo stop at the historic Wrigley Field, we drove down Lakeshore Drive to spent a couple of hours to see the sights in and around the Millennium Park area, in the heart of downtown Chicago: The Art Institute, home of Seurat’s A Sunday on La Grande Jatée; the symphony orchestras, one of which was rehearsing in the Pritzker Pavilion for an upcoming concert; Crown Fountain, where kids cooled off by splashing in the shallow water; Buckingham Fountain, as seen in the introduction of Married with Children; Chicago Harbor, on the shores of Lake Michigan; and the scenic bridges spanning across the Chicago River. But the most interesting (and possibly most photographed) icon of the area is the art scupture called the Cloud Gate, more commonly known as “The Bean” due to its shape. With its completely reflective surface, it makes for some really surrealistic photos and poses — so much that I just had to touch myself. “This is much better than Cleveland,” was Cheryl’s initial impression of The Windy City. After an obligatory fill of Chicago’s famous deep dish stuffed pizza at Giordano’s downtown, we headed west on I-90, the interstate highway that would take us out of Illinois, beyond the farmlands and grain silos of Wisconsin — home of cheese (and apparently fireworks) — across the mighty Mississippi River, and all the way to our final destination of the day: a lake house in Minnesota just south of Minneapolis/St.Paul, that Cheryl’s cousins shared with extended family. “Isn’t [Minnesota] the ‘Land O’Lakes?’” I asked Cheryl as I wondered behind the steering wheel. “I don’t know, is it?” She googled it and discovered that Minnesota is in fact the home state of the Land O’ Lakes butter company, mostly because Minnesota’s nickname is the “Land of 10,000 Lakes” — it’s even mentioned on their state license plate. “I guess if you’re going to go to Minnesota, you should go to a lake,” Cheryl said. 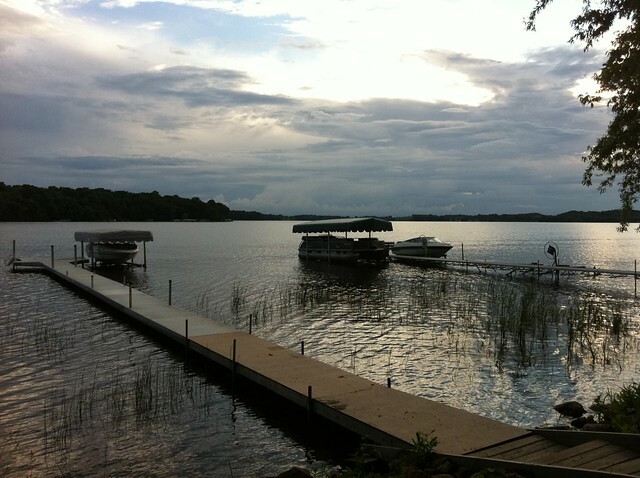 IT WAS AROUND EIGHT IN THE EVENING when we arrived at the hamlet of Elysian, MN (population 486), home of Lake Francis, one of ten-thousand lakes in the state of Minnesota. It is a small, scenic lake lined with summer lake houses, each with its own private pier for private boats to cruise around. The off and on rain that evening and following morning prevented us from sailing though, which was okay because we had company. “Do you want a Corona or a margarita?” asked Elsie, one of our hosts of the evening, to start things out nicely after a long day of driving. “Um, I’ll have a margarita,” Cheryl answered. Hosting us was Cheryl’s cousins Cherrie and Elsie, two older yet youthful Filipinas, both married into Minnesotan families. I could tell by their slight accents. “Filipino accent?” Cherrie asked me. “Filipino-Minnesotan!” In addition to the way they pronounced their “O” sounds, I noticed that they often said “Oh yah,” as Minnesotans do. Cheryl and I made ourselves at home with the two beds in the living room, which I assumed were set up for the rotating people that used the house in the summer amidst three families. Cherrie thought it was cute that the two of us were young-looking, with our respective laptops on our beds. “It’s like a college dorm,” I said. Our stay at the lake house was a pleasant one. We had margaritas with snacks and chips in the backroom overlooking the lake, along with good conversation about life, adventure travel, Cheryl’s move, and what it’s like to go ice fishing. (“You just sit in an [ice house] and drink beer.” My kind of sport.) We ate a home-prepared meal of chicken, green beans with mushrooms and bacon, and broiled organic pork that Cherrie’s family bought from an Iowa farmer — she and her husband split half a pig with her in-laws. “I figured you would told me if you were vegetarian,” Cherrie said. I was impressed with the display of meat. “It’s for his blog,” Cheryl said. It was from the same pig at dinner that gave us the thick-cut bacon we made the following morning, when Cheryl and I tried to return the favor of the dinner by making breakfast. I made garlic fried rice with bacon fat (a bacony variation of a Filipino breakfast staple), which Cherrie and Elsie were happy about; they had missed Filipino food and reminisced about it fondly during dinner as we ate a dessert of brownies and oven-baked banana bread. WAKING UP TO THE PEACEFUL SOUND OF RAIN and birds chirping was a nice prelude to the American countryside that Cheryl would camp in for most of the rest of the road trip — which we continued that morning, but not before saying our goodbyes to Cherrie and Elsie after a brief but well-worth visit. “I’m so glad we came,” Cheryl said. Her cousins were happy that we came as well, not only to catch up with family, but because I was tall enough to get things in high places for them (even though I’m just 5’ 6”). “Come back for ice fishing!” Cherrie told me. The two of them packed us a lunch — baon, a very Filipino thing to do — and wished us a good trip. We waved them goodbye as we drove out of the driveway and onward to the American West. Our time in the Land of 10,000 Lakes was brief, but perhaps if you’ve seen one, you’ve seen them all. Have you passed any of the flooded river territories? bacon grease rice looks SO GOOD!!! I also love the chicago bean. Mmmm….garlic fried rice….yum! I’ve never driven cross country but it seems like you guys are traveling faster than I expected. Hello Fellowship of the Blog! In via SMS from Erik - He’s at Yellowstone National Park w/o electricity. He states the park is really nice…. stay tuned for more to come maybe by WHMMR….